It’s all about minimizing efforts and maximizing output these days! Today’s Tech Tip explains how to make certain “auto” features work for you when crunching numbers and analyzing data. To quickly get the Sum of a range of cells, all you need to do is select the range, and then click AutoSum—even quicker, select the range of cells and look in the lower right-hand side of the Excel window, the so-called Status Bar (more detail to follow). Select the range of cells you would like to get the sum of by highlighting those cells. Select an empty cell to the right or below the numbers you want to add, then click AutoSum on the Home tab (Box 1). 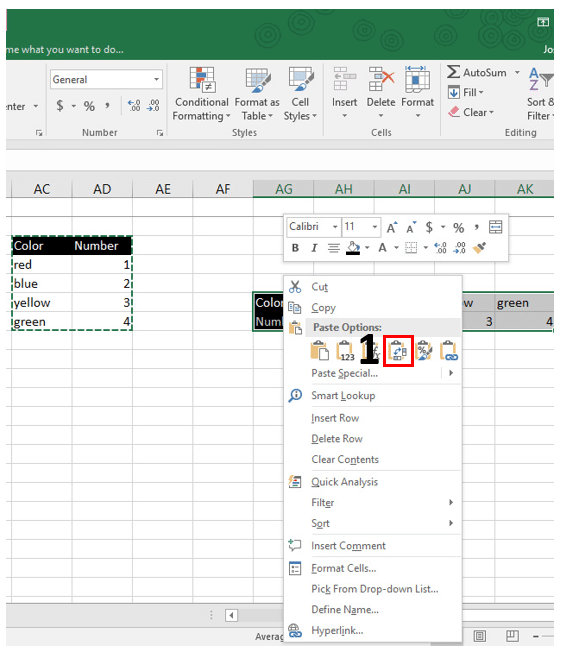 If you want to quickly get the Sum of a range of cells, all you need to do is select the range of cells (by highlighting them) and look in the lower right-hand side of the Excel window (Box 1). If you then right-click on the Status Bar, a feature dialog box will pop out displaying all of your options. Instead of entering data manually into a worksheet, you can use the Auto Fill feature to fill cells with data that follows a pattern or that is based on data in other cells. 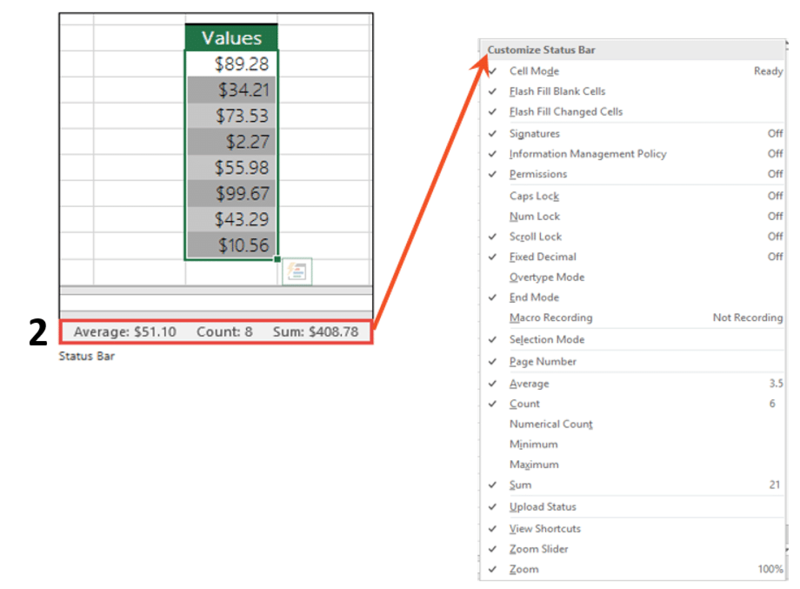 To quickly fill in several types of data series, you can select cells and drag the fill handle. In this example, the Fill Handle is located at the lower-right-hand corner of cell #3. Then, drag the fill handle across or down the cells that you want to fill (down to cell #10, in this example). After you drag the fill handle, the Auto Fill Options button is displayed (box 1). To change how you want to fill the selection, click the Auto Fill Options Button, and then click your preferred option. 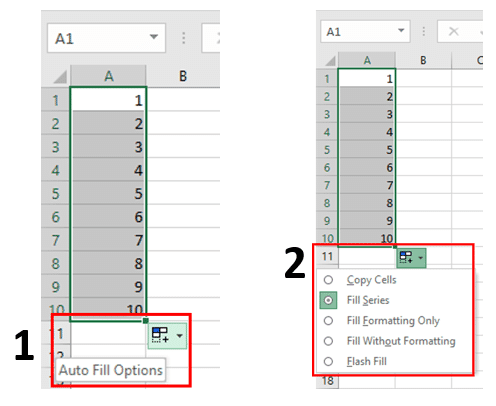 When you need to enter a lot of repetitive information in Excel, such as dates, the AutoFill feature can help; however, when you need to quickly split a single column of data into multiple columns, Flash Fill can do the work for you. Flash Fill recognizes patterns in your data, and completes the data accordingly. Start by typing the first name the way you want it (into the First Name column). Then, start typing the next name into the next cell down, and Excel provides a preview of the names formatted the way you want (Box 1). Press Enter and Flash Fill will fill-in the names for you. Once the data is filled-in, Flash Fill provides a drop-down box with various options you can apply to your data (Box 2). 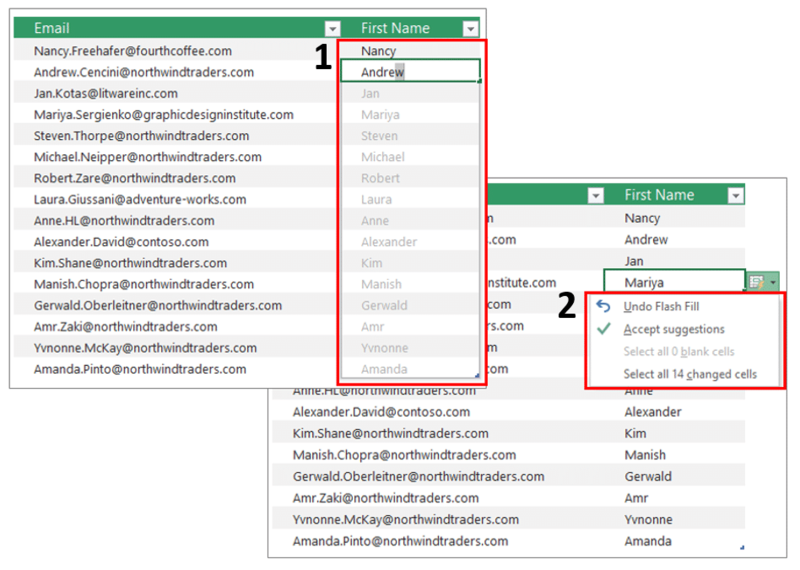 When you have an Excel worksheet with data in columns that you want to rearrange into rows instead—or vice versa—Excel’s Transpose feature can help you do that. Select the range of data you want to rearrange, including any row or column labels, and copy it (either right-click > copy, or Ctrl+C). Next, pick a spot in the worksheet that has enough room to paste your data. Then, right-click the first cell where you want to paste the data, and select the symbol for Transpose within the “Paste Options”. The data you copied will overwrite any data that’s already there.